the cat’s out of the bag on this florida beach house! the project was just featured on home bunch and i’m so excited i can finally share these photos and a little bit of the behind the scene of how this project came to be what it is today. this project was an absolute dream to work on, and with clients that were a dream to work with! when my clients bought a gorgeous lake-front lot with gulf views in watersound beach off of 30a, in florida’s gulf coast, they called on me, ts adams studio and gulfview construction (otherwise called the “A team” by our clients) to collaborate on this brand new, ground-up construction project in a stunning gated community. they wanted a comfortable and elegant oasis that they could enjoy for years to come. one of my favorite things about new construction is watching the house come together from the studs up as a reflection of my client’s specific needs and aesthetic. unlike with a renovation, there really are limitless possibilities! 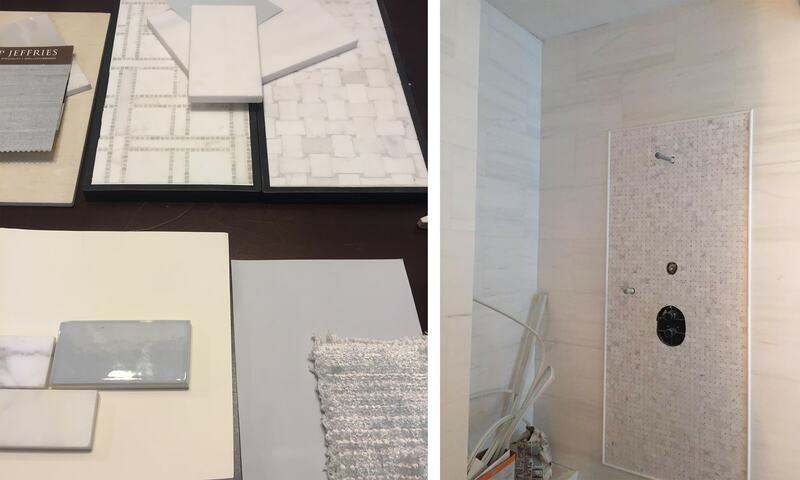 grab a glass of bubbly and take a look through these progress and finished photos. “our home will have a well-designed layout for relaxing or entertaining indoors or outdoors, enhanced by the lake and gulf views. 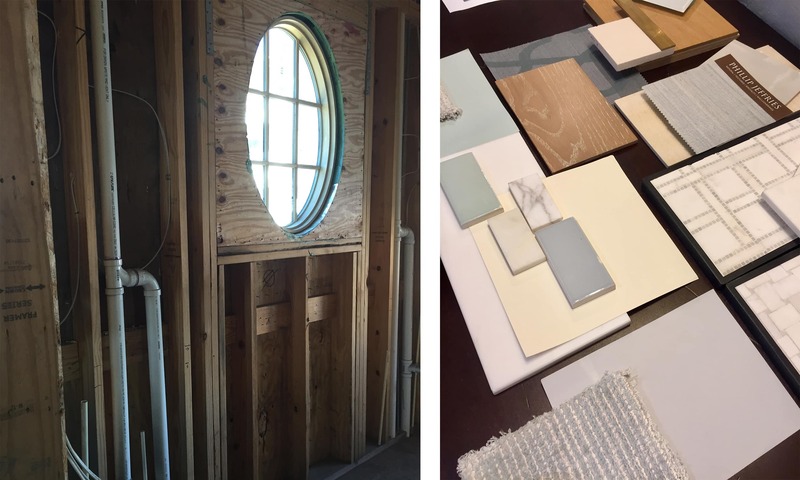 this home will be beautiful—using a soothing color palette and quality finishes, a touch of modern or playful elements where they are not expected. It will be comfortable, not formal. this home will evoke positive energy—one that encourages great conversations, laughter and warmth. 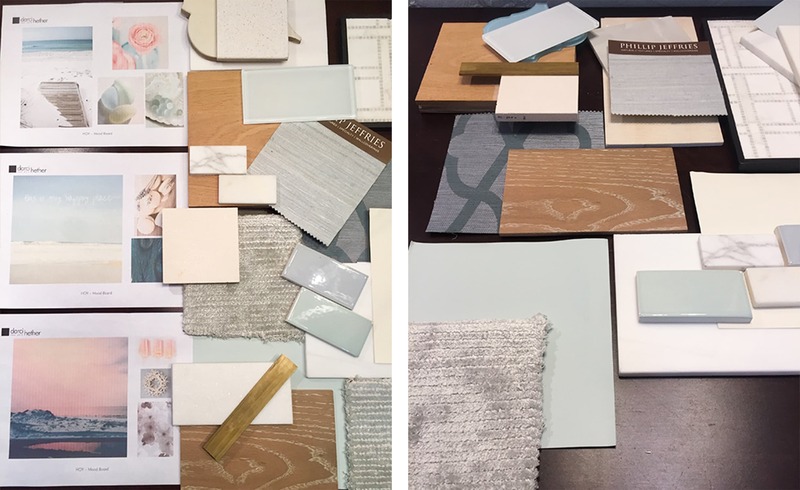 with the above directive from my clients in hand, we started by creating mood boards. then, i pulled the main architectural materials that would start to bring those words to life. 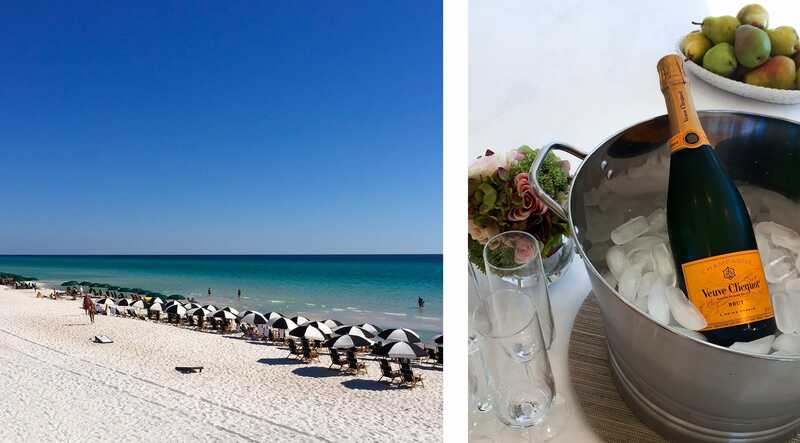 the mood boards depicted watery, soothing, and relaxing imagery in colors of soft green sea glass, delicate blush colored flowers, creamy orange colored creamsicle, and accents of sandy starfish… all the gorgeous colors that are found throughout watersound beach. 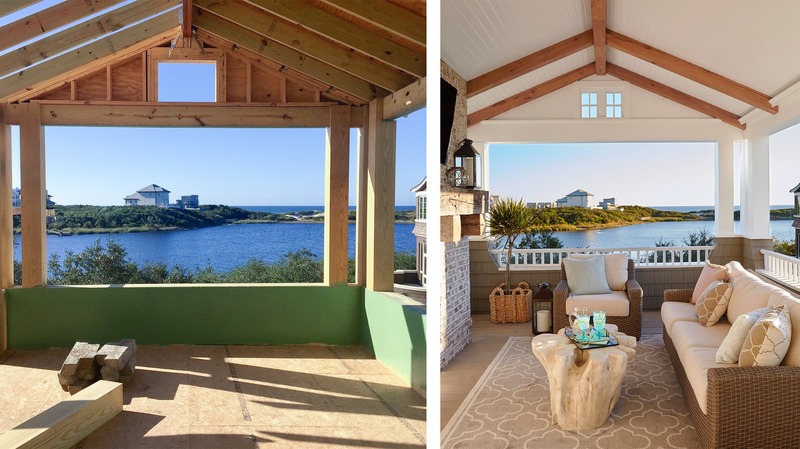 since the views are one of the most striking parts of this property, i drew on the colors of the water, the beach, and the sunset in order to marry the inside and the outside! while all of the beautiful material selections were getting buttoned up, construction was getting underway! 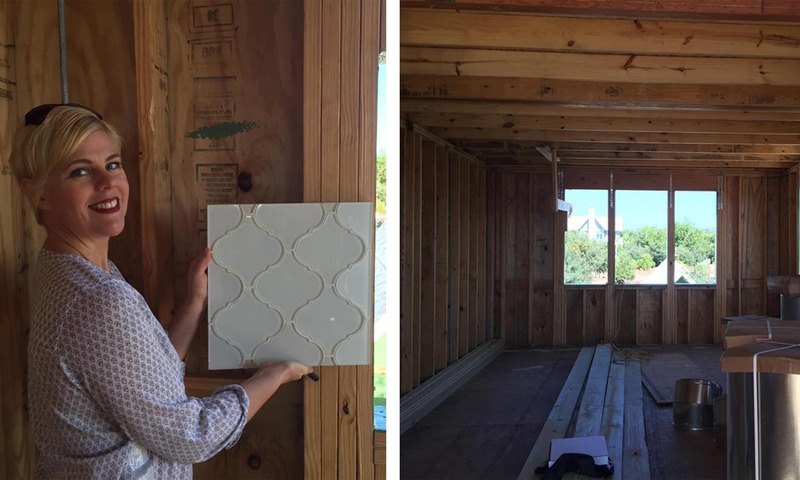 during a site visit, i was able to show our clients firsthand a sample of the beautiful watery arabesque patterned backsplash that would wrap the walls in their large chef’s kitchen. the soothing color and movement of the gulf waters were my inspiration behind the tile choice for this backsplash. 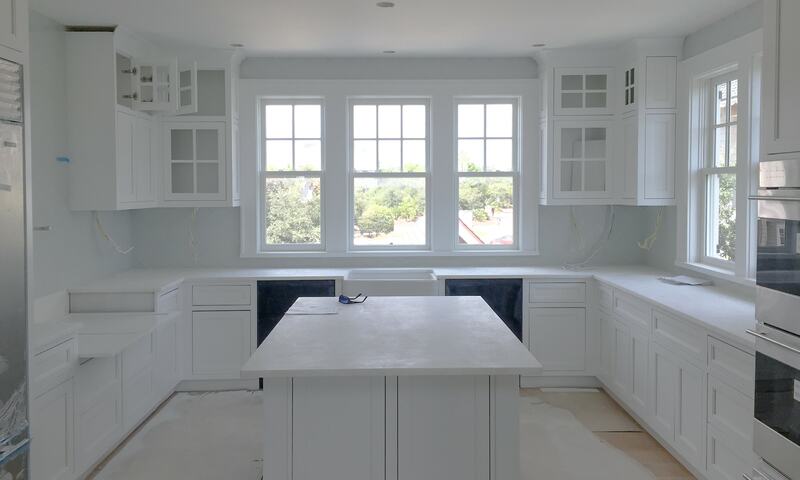 all of the custom designed cabinetry was installed and ready for the pièce de résistance! there were so many incredible design elements that we attended to in this kitchen but my personal favorites were the custom range hood we designed and, of course, the stunning backsplash! because we were employing such a beautiful architectural material, i designed the many other elements of the kitchen to be more subtle so they wouldn’t compete with the shining star of the space. 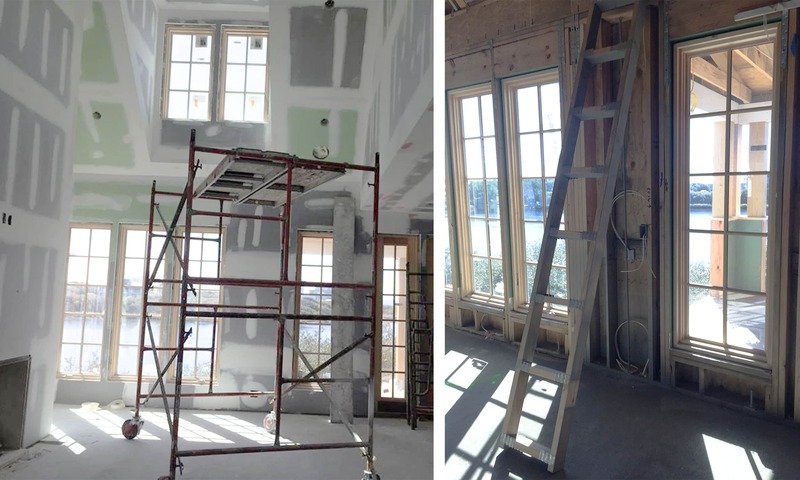 once the contractors install the living room windows and dry-wall, my clients and i were really able to fully appreciate the grand scale of this room! ….not to mention the view! the living room is full of natural light, with breathtaking views of the gulf. 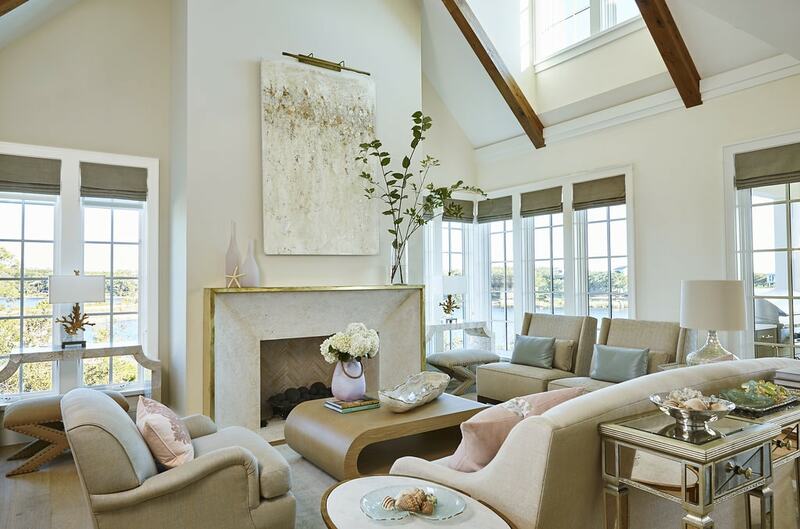 i made sure that the furnishings and materials used here were of soft, sandy hues with organic curves, and i used touches of accent colors that mirror the colors found in nature just outside the large paned windows. i talk about how versatile blush is in a color palette in last week’s blog post, and here it is in action! my goal with the master bedroom was to create a peaceful retreat for the homeowners. the word “serene” kept popping up in our conversations about this room, and i think we delivered! inspired by the glassy blue waters of the gulf, i selected a watery-blue textured wallpaper to add a softness to the room, and a break from the bright florida sunlight. i love how the texture of this silk wallpaper gives the room so much dimension, and swathing one’s walls in a soothing color or material is one of my favorite ways to turn a bedroom into a serene retreat. 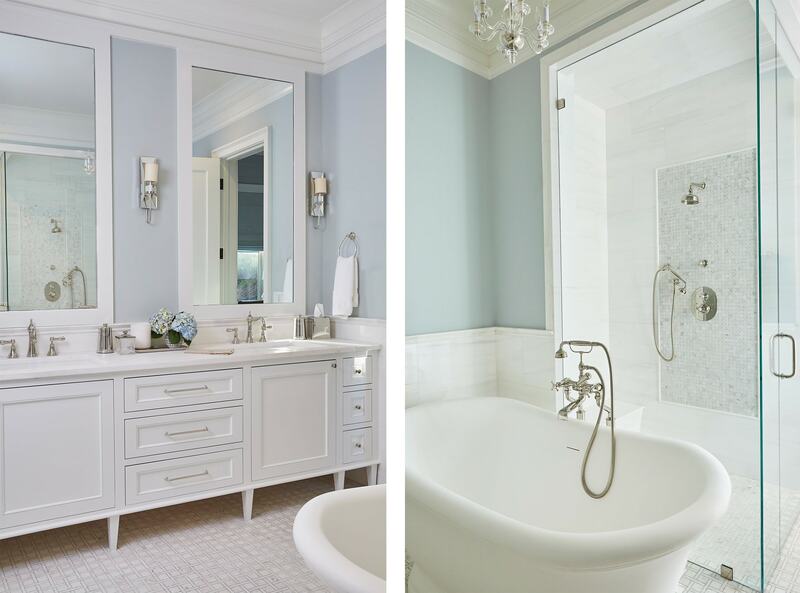 stepping into this master bathroom is like stepping inside a jewelry box. the gorgeous mosaic flooring and inset on the shower wall were made of a beautiful white marble with the outline of the pattern containing light reflecting soft green glass chips. the whole place just sparkles! i selected classic and elegant fittings to continue the spa-like feel, and make this bathroom feel elevated but still casual and comfortable. i think it’s so important to keep bathrooms feeling timeless and airy! if the first two floors were all about sophisticated and relaxed entertaining, the third floor was all about creating a super fun, highly casual space! my clients purchased a beautiful piece by local artist francisco adaro, and it was the perfect starting point for the color palette in the den. it informed all the upholstery and rug choices, and his beautiful abstract painting has that perfect je ne sais quoi. 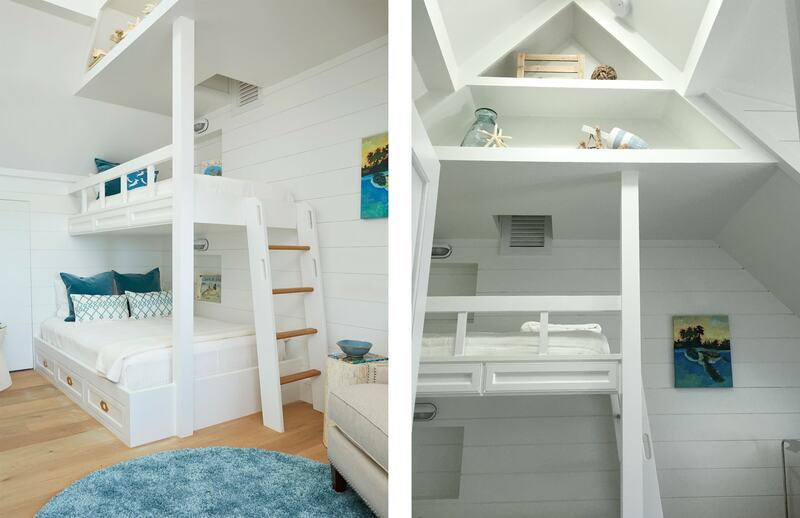 what’s a casual beach house without great spaces for young’uns to flock to and escape the parents? this top floor bunkbed kids bedroom and rec room was the perfect place to really play with brighter colors, patterns and textures. to up the fun-factor, i amped up the intensity of the color palette, and i designed a bespoke built-in bunk bed with added shelving to emphasize the roof line. i love seeing the raw space next to the finished product here—the white ship-lap walls really emphasize all that gorgeous florida natural light. these two first floor guest bedrooms are the perfect, serene place for our clients to host their guests. i opted for blush accents to play off of the soft blues in the first bedroom, while the adjacent room features soft greens and sandy tones, tying in the aesthetic of the whole house. the white ship-lap walls in this three story stairwell tie in that casual beachy vibe, and i love the way the open curves of this light fixture fill out the space. lighting is such a great way to emphasize the lines of a space. 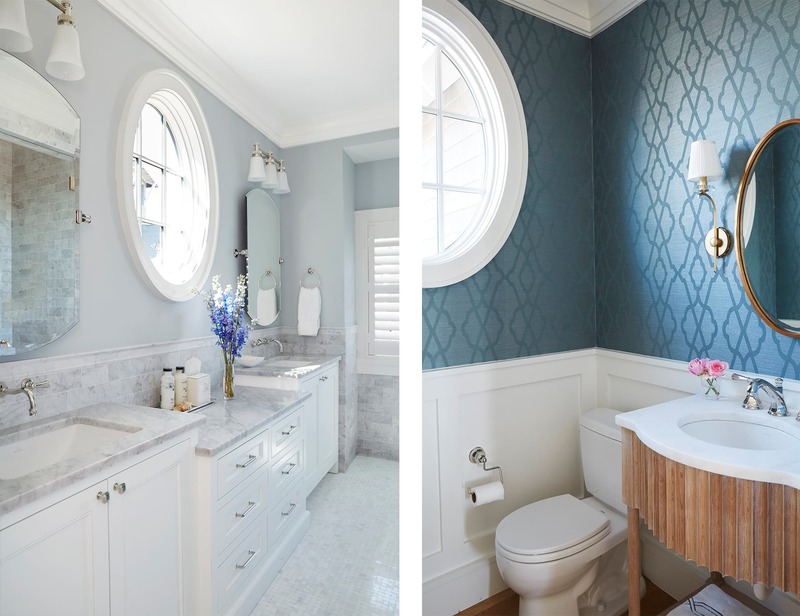 these porthole windows in the secondary master bathroom (left) and powder room (right) are so much fun. in the powder bath, i custom designed the vanity to keep with the warm, beach-y wood tones. and how gorgeous is that patterned grasscloth wall paper? 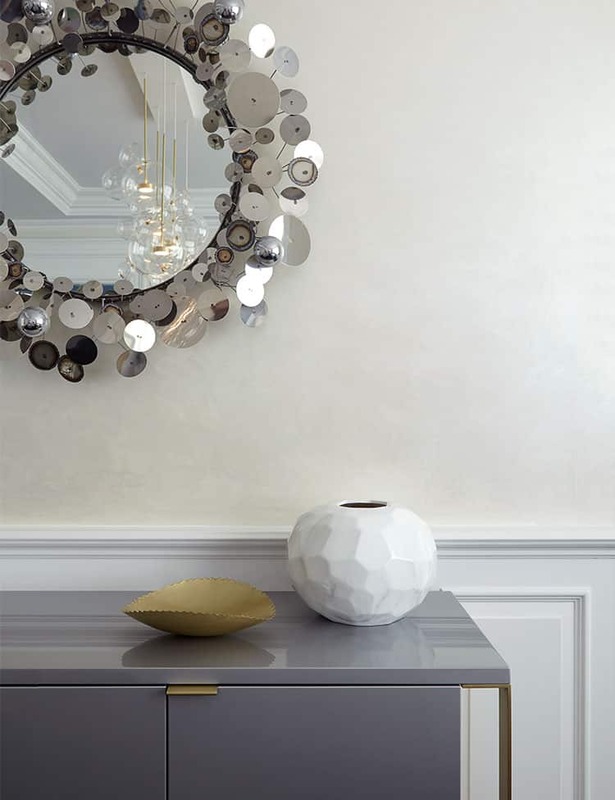 the soft brass accents pop beautifully and overall add another dimension to this space. while i truly love all of the soothing colors, chic furniture silhouettes and quality finishes that we incorporated in the design of the interiors, the jaw-dropping view became one of the most important parts of the house. indoor/outdoor living was so important to my clients. i designed this patio to be a comfortable place to relax in front of the fire on cooler nights. 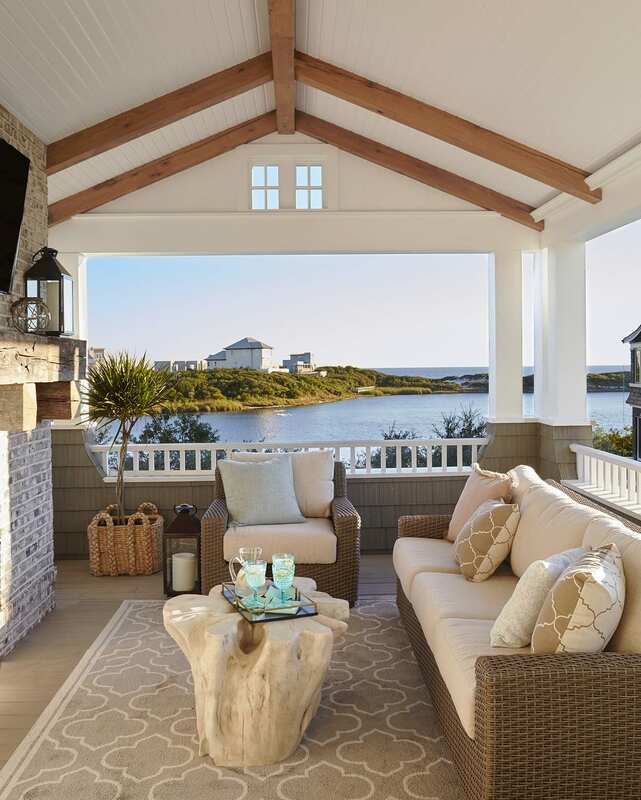 bonus: who doesn’t want an outdoor tv area overlooking the beach? swoon! i’ve said it so many times before to anyone who would listen but i’ll say it again here. this project was truly a labor of love and i count it as one of my career highlights. working on amazing projects and with such fun and thoughtful clients never gets old…… and the location wasn’t bad either!! of course, we had to celebrate completing this project within view of the beach. 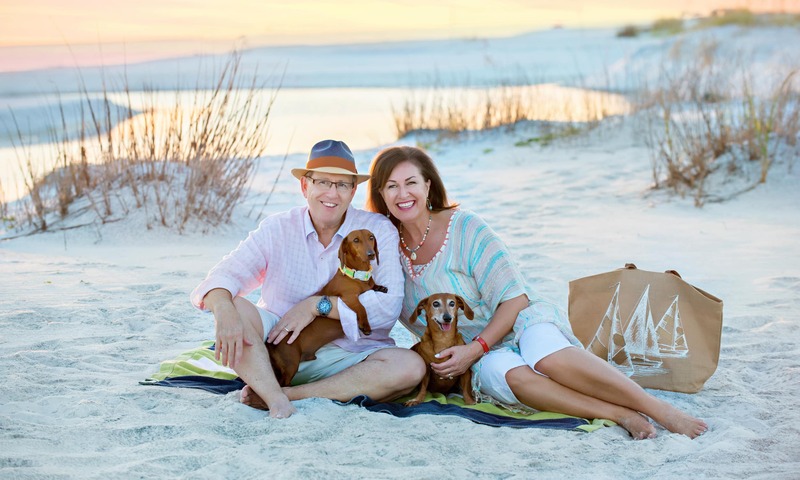 my clients and their adorable dachshunds certainly seem to be enjoying florida beachfront living! want to see more? check out the full portfolio page. DO HAPPEN TO REMEMBER WHO THE VENDOR WAS? I WOULD LIKE TO GET a sample. Happy New Year! 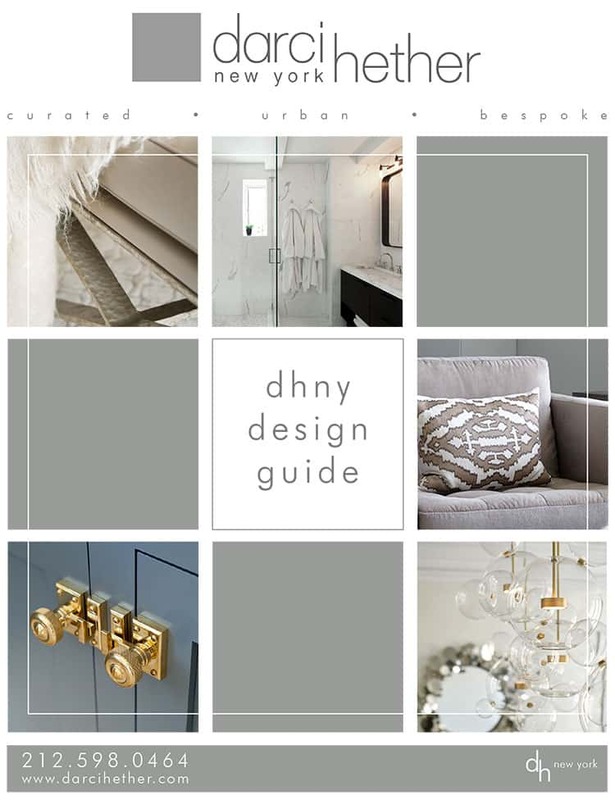 My name is Danielle Dickinson, and I am the new social media gal at DHNY. I was going through emails and saw this question marked as unanswered. Did you ever find the blue grasscloth you wanted? If not I can locate this information for you asap.